As the leading site for patent analytics, Patent Buddy offers an effective way to reach your target audience. We have over 100,000 unique visitors a month and thousands of registered users that utilize Patent Buddy to track their patent portfolio and following the patent activities of their competitors. We limit our paid advertising on the site to assure that you get the attention you deserve. We reserve a 300 X 750px block for display on each page and will accept up to 300 X 1500px of ads site-wide. When you purchase one ad slot, your ad will be displayed to users on half the pages they visit. If you would like your ad to be displayed on every page, you may purchase two ad slots for the same ad. Additionally, the vertical position of all ads will rotate, ensuring that each ad gets its fair share of time at the top of each page. This system ensures that every ad will display on every page of our site and that every ad will receive equal positioning. It also means that site visitors will see your ad multiple times as they navigate through the site. Based on our recent traffic, your ad will receive approximately 117,000 impressions across 111,000 unique visitors, each month. Below is a summary of the monthly unique visitors to Patent Buddy over the last 6 months. 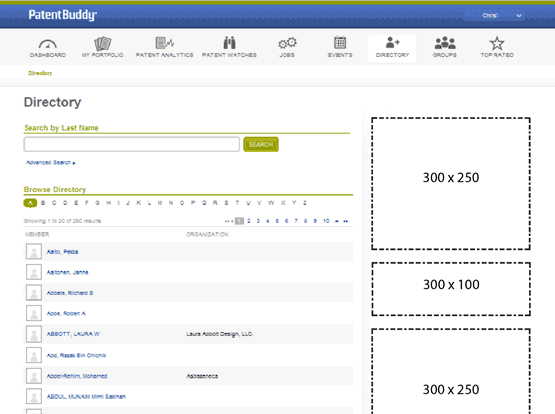 Patent Buddy has a rapidly expanding user-base and averages over 100,000 visitors each month. Patent Buddy has a highly educated and affluent audience. Prices for one ad slot. Your ad will display on every other pageview. If you would like your ad to display on every pageview, purchase two adslots for the same ad. Contact us for quotes on custom sizes. Our advertising is cost effective. Currently a 300X100 ad, with a six month commitment, will have an approximate CPM of $9.60. If you have questions or wish to advertise with us, contact Chris Winger by calling 612-354-8672 or sending an email to cwinger@patentbuddy.com. 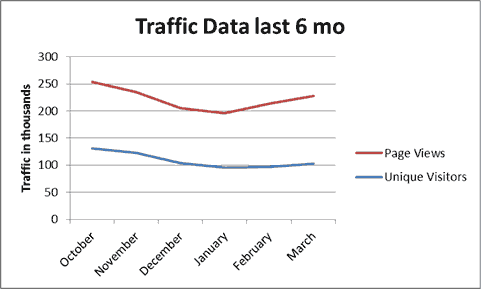 These estimates are based on traffic data from Oct. 2011-Mar 2012. Future performance not guaranteed and will vary based on site traffic. Based on one 300x100 ad slot with six month commitment ($960) divided by one-half our average page views (100,000) times 1000.